The last time I was in Quebec City, I was 12 years old on a school trip. Save for a few fuzzy photos taken with a disposable camera at a museum, I hardly remember the day—or the city for that matter. But I was drawn back to Quebec through the siren call of social media where tweets and Instagram posts reminded me just how much there is to see in the beautiful old city. After a recent heavy snowfall, road conditions left a lot to be desired, so my boyfriend and I boarded the train from Montreal for our weekend getaway. We arrived later in the evening at Gare du Palais and checked into Hotel 71 in the heart of Old Quebec. This sleek and trendy boutique hotel blends neo-classical architecture with a modern interior design. 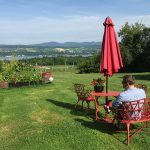 While our fourth story window boasted a spectacular view of the Fairmont Le Chateau Frontenac, the first thing I noticed about our room was the 14-foot high ceiling— which went over well with my partner, whose height is well above the 6 foot mark. At that point our rumbling bellies demanded attention, so just a hop, skip and a jump away, we found ourselves at Café St-Malo, a quaint and cozy French bistro. On the menu were French classics like cassoulet, steak-frites and salmon tartare, but whenever duck confit is an option, I say a little carpe diem to myself and order just that—and it did not disappoint. As we ate, we couldn’t help but marvel at the loveliness of the street outside covered in powdery snow and shimmery moonlight. Although the weather was set to hang around -18 degrees throughout the weekend, we layered up from head to toe in proper Canadian fashion and into the deceivingly sunny outdoors we went. 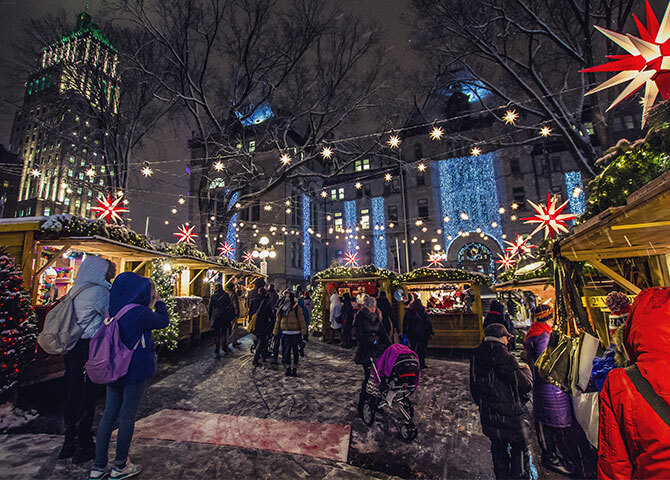 We made our way through the small cobblestone streets and rustic shops of Quartier Petit Champlain where the festive decorations and lights give an air of magical whimsy. 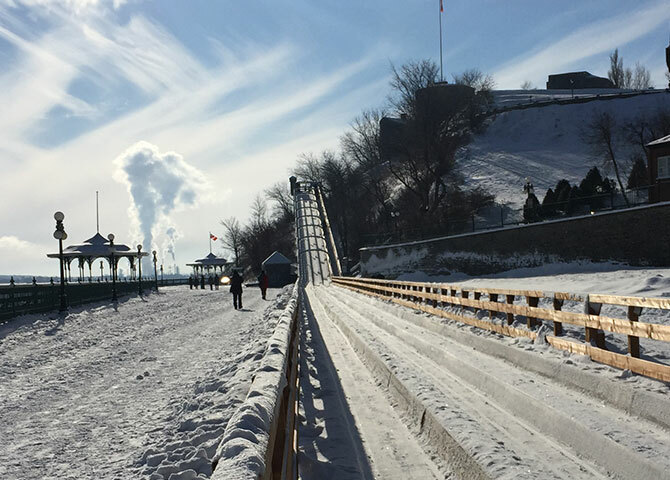 Our first stop was the Dufferin Terrace at the foot of the Chateau Frontenac to check out the century-old ice slide. I know that fortune favours the bold, but with speeds reaching up to 70 km/hour on the way down, we opted to watch as braver souls went down instead. 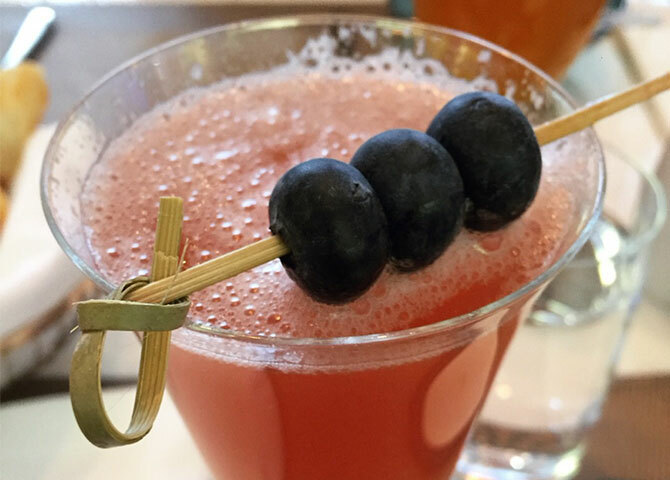 For lunch, we stopped at Bar Artefact, the lush bistro bar at the historic Auberge Saint-Antoine. True to its name, Artefact displays dozens of relics and antique items found on the property during excavation over the centuries: pieces of pottery, blown-glass bottles and even a canon. Sipping a tequila and rosewater-based cocktail, I ordered a delicious creamy chicken dish served with wild rice and asparagus to warm myself against the frigid air outside. On velvety orange and turquoise couches, we ate surrounded by luxurious décor and hundreds of years of Canadian history. The Rose’s Fizz cocktail at Bar Artefact. 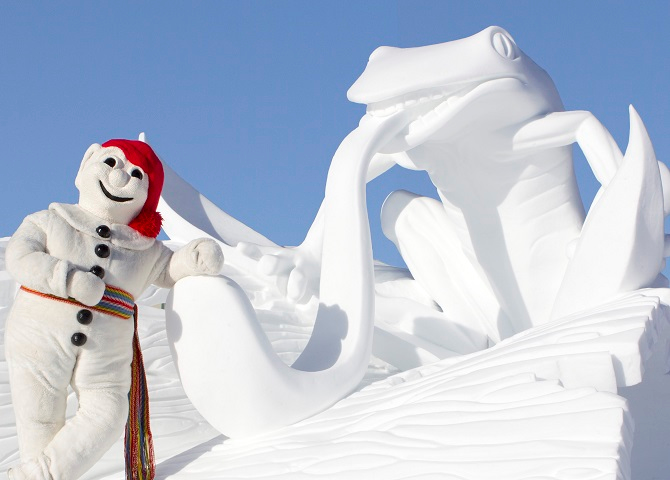 Québec City’s Carnaval (February 8 to 17) and Bonhomme are synonymous with winter. Between the ice canoeing, parades, skating, and sleigh rides there’s something for participants of all ages to enjoy. Come marvel at VIA Rail’s ice sculpture, which includes a giant mural of the Québec Bridge as well as an imposing piece inspired by the locomotive prototype of our new fleet. 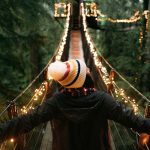 VIA Rail ambassadors will host activities near the mural, and festival-goers can take photos with yellow VIA Rail accessories such as scarves, giant mittens and tuques, so get your cameras ready! There are countless museums in Quebec City, but as a self-declared history buff, I had to check out the Museum of Civilization. In their latest exhibit, the history of Quebec’s Aboriginal people is chronicled through paintings, photographs and other traditional artwork in This is Our Story. With about an hour left of daylight, we rushed over to the Observatoire de la Capitale to catch the sunset from the 31st floor lookout. 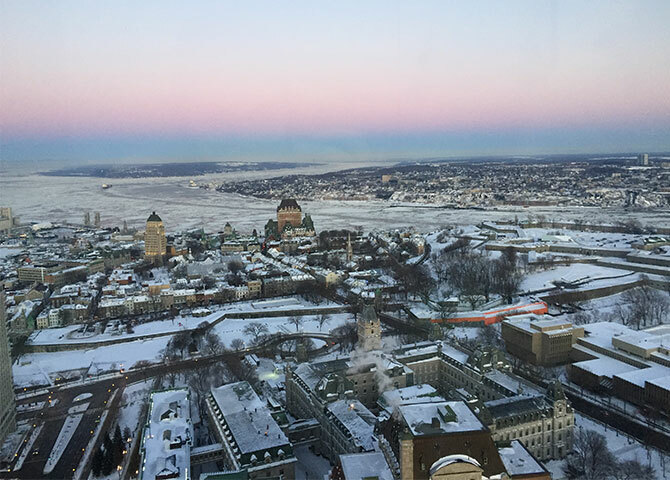 The sky was cotton candy pink and the city was blanketed in white snow, creating a truly ethereal 360 degree tableau of Quebec City in the winter. View of the city from the 31st floor of Observatoire de la Capitale. Daylight gone, we headed to the nearby annual German Christmas Market at the Place de l’Hôtel-de-Ville where vendors sold artisanal products, holiday crafts and other typically German things. We happily walked through the festively decorated stands, the musicians and the performers with a cup of warm mulled wine to fend off the cold. The evening ended at Chez Boulay- Bistro Boréal, a restaurant that came highly recommended. Inspired by Nordic cuisine and using sustainable practices, the menu is constantly changing and entirely seasonal, cooking with ingredients almost exclusively from Canada’s boreal region. To start, I ordered a winter vegetable medley; had I known as a child that brussel sprouts and squash tasted this good, I would have swapped my pop-tarts for veggies in a heartbeat. Eternally indecisive, my boyfriend ordered the Chef’s duo to share: a plate of buttery scallops, medallions of tender deer meat, polenta, mushrooms and coleslaw. Paired with a bottle of red wine, this was hands down one of the most unique and satisfying dining experiences I’ve ever had. 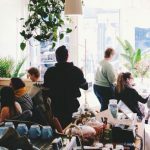 On our last day we ventured into the Saint-Roch neighbourhood for a food tour. What better way to get to know an area than through its gastronomy? We began at the Fromagerie des Grondines et ses amies shop where we sampled several different local cheeses and organic charcuterie. 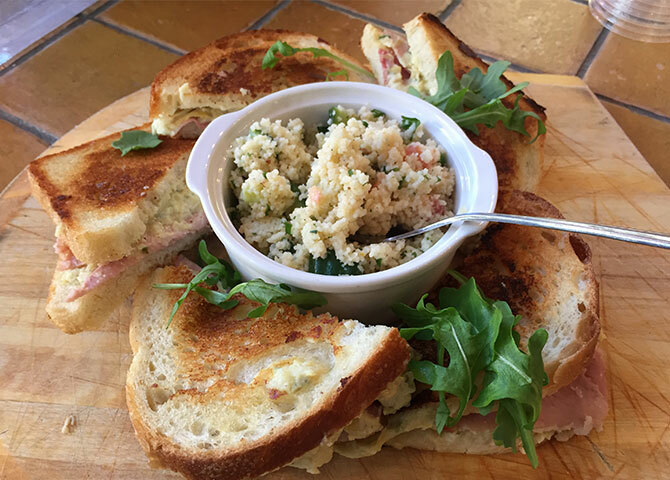 It was another chilly day, so we welcomed the gooey grilled cheese sandwiches with open arms. Lucky for us, the next four locations were within minutes of each other. Meanwhile, our enthusiastic tour guide Sébastien kept us distracted and informed about Saint-Roch’s recent revitalization and vibrant artistic community. Next stop: Noctem Artisans Brasseurs. A brewery after my own heart, the establishment is decorated with everything feline. We ordered a “litter of kittens” aka a flight of four different small brews including an amber cream ale, a stout, an American IPA and a saison. 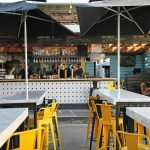 Noctem also differentiates itself from other breweries by offering pub food with a health-conscious twist where absolutely nothing is fried. Yummy grilled cheese sandwiches at Fromagerie des Grondines. Unlike Noctem’s poutine, our next stop, fast-food joint Chez Ashton, served up poutine the traditional way, which our American tour group counterparts quickly devoured. We then stopped at Camellia Sinensis Tea Shop, known for their herbal Labrador tea, before finishing the excursion with a milk chocolate hot cocoa at Champagne Chocolatier. After our tour, we walked off some of the afternoon’s delicacies on the streets of Saint-Roch where cute coffee shops, art galleries, boutiques and bars abound, before hopping back on our train home. 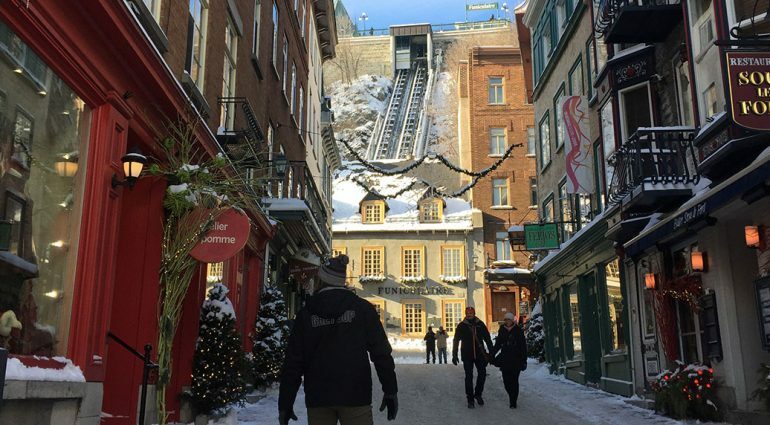 For sure, it can get cold, but there is so much to do in Quebec City in winter, it’s definitely worth flattening your hair under a tuque for a weekend. 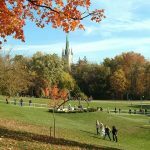 4 Comments on "Winter Fun in Quebec City"
Great article! Makes me want to plan a trip. As far as I know, Quebec city is one of the best cities to eat in North America. Even if it’s a little bit cold during winter time, I had such a great time in “Carnaval d’hiver”! Love Quebec! I’ve only been in the summer so it is fun to read about Quebec City in the winter. Great photos!